Tyler Nipper and Paul Muzljakovich of the University of Oklahoma. 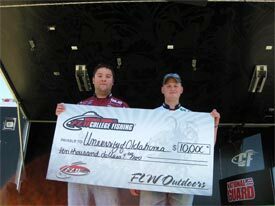 The University of Oklahoma team of Paul Muzljakovic, Wagoner, and Tyler Nipper, Norman, won the National Guard FLW College Fishing Texas Division event on Lake Texoma Saturday with four bass weighing 10 pounds, 13 ounces. The victory earned the team $10,000 to be split between the university and the university's bass fishing club - $7,500 for the bass club and $2,500 for their school. The win also secured them a position in the Texas Division Regional Championship. "We did not get much preparation time in as our school and test schedules have been very hectic," said Nipper, a junior energy management major. "We got here late yesterday and got a couple hours of sleep in the parking lot and went out on the water this morning." "We did not have a real definitive plan," added Nipper. "We went out and were hoping to get something going early and go from there. We threw all different kinds of stuff from topwaters to jigs, and we were fortunate enough to get what we did to get us here." With only 21 of the 40 teams bringing fish to the stage, the conditions challenged everyone. "The day was tough due to the conditions," said Muzljakovic, a junior majoring in accounting. "There was 15 mph wind pounding the marina this morning and that put a damper on everybody's day. A cold front and storm came through earlier this week and we thought it would be tough and it was." "We started out today junk fishing and about 11 a.m., my partner started catching fish on a crankbait and I caught one on a jig and it just worked out from there for us." The duo said they caught their fish on a crawdad square-billed crankbait and a Trendsettertackle 5/16 oz. River Craw finesse jig with a green pumpkin Zipper Grub trailer. The top five finishing schools from each the four qualifying tournaments in the Texas Division have advanced to the National Guard FLW College Texas Regional Championship. The dates and location of the tournament will be announced in the near future. For regular updates, photos, tournament news and more, follow College Fishing on Facebook. Visit CollegeFishing.com to sign up or to start a club at your school.